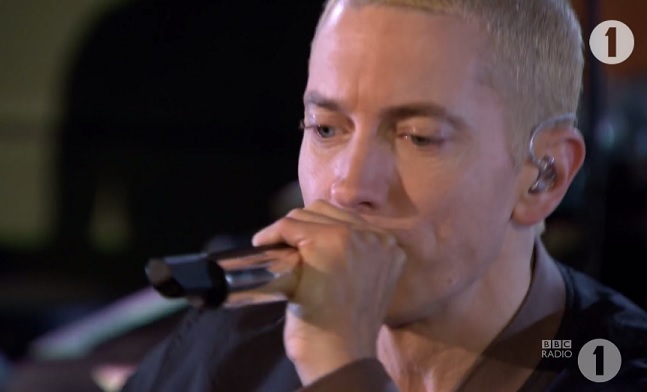 Backed by a live band and hype man Kon Artis, Eminem took the stage at BBC’s Maid Vale studios for Radio 1 and performed his new single “Berzerk.” The track is featured on Eminem’s latest album, The Marshall Mathers LP 2. Watch the Detroit native in action as he performs to the camera and turns the energy up for viewers. This entry was posted in Live Performance, Video and tagged BBC 1 radio, berzerk, concert, eminem, hip hop, live performance, rap, the marshall mathers LP 2. Bookmark the permalink.